Mine: Very well done Sci-Fi. Interesting on many livels; visually startling, intelectually stimulatin, and just a good fun ride. Interesting biblical paralells. Highly recommended. (out of 5 stars) Excellent Movie! Interesting and Great Special Effects! 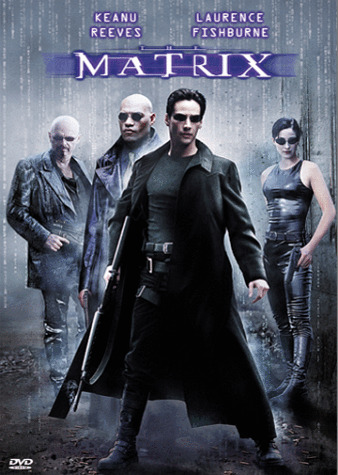 (out of 5 stars) The Matrix is really a COOL movie to watch. If you want it to, it could make you think about what the future holds for us humans, But if ur not in the mood for that, just sit back and enjoy the special effects this movie throws at u and enjoy. (out of 5 stars) A terrible, violent film that TOTALLY makes you want to take the pill that let's you forget. Who'd want a "real" world that's gray and tasteless like the one in this movie? PLEASE, I will be fooled, thanks. Oh and Keanu Reeves is as exciting as a broomstick with hair. (out of 5 stars) Very, very good watching, and made think to follow the story line. The fight scenes are very well done, and make you want to see the sequel.